University of California Press, 9780520256521, 288pp. 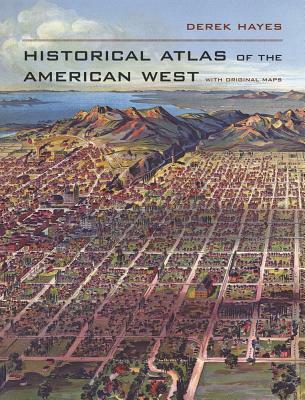 Spectacular in scope and visually brilliant, this atlas presents a sweeping history of the American West through more than 600 original, full-color maps and extended captions. From the earliest human inhabitants and the first European explorers to the national parks and retirement resorts of today, this extensive collection chronicles the West from uncharted territory to a well-populated Eden. We bear witness as state lines strike through Native American territories, see the frontier crack open and the railroad's iron belt snake across the Plains, and watch as the West's cities, from Los Angeles to Las Vegas and Albuquerque to Anchorage, rise and prosper. This is the first atlas to compile all the historically significant maps relating to the American West; it includes field sketches of battles, the first maps to show the West, maps depicting mythical rivers and fictional towns, and maps showing early conceptions of California as an island. Distilling many centuries into one fascinating volume, this atlas traces history as redwoods, mountains, and deserts become California, Montana, and Arizona, and offers a rare opportunity to see the west through the eyes of its earliest explorers. Derek Hayes is the author of Historical Atlas of the United States, Historical Atlas of California, and Historical Atlas of the Pacific Northwest, among other books.